Elgato's EyeTV Netstream streams TV around your home network | What Hi-Fi? 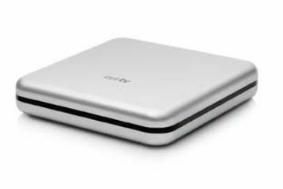 Forget fiddly cables or PC TV tuners, Elgato promises all that's required is an aerial connection, a network and Elgato's magic box and accompanying software. Plug the EyeTV in to your router and your landline, set-up the software on your computer, and you should be in business. The dual tuner ensures two computers can receive TV content simultaneously – extra connections can be added with more boxes – while there's also a version that works with the Apple iPhone. While the EyeTV Netstream DTT is capable of dealing with DVB-T HD content, it's sadly not compatible with the UK's DVB-T2 system for Freeview HD. Still, with the ability to record as well as watch two channels simultaneously on separate computers, it's an interesting proposition for standard Freeview users. The Elgato EyeTV Netstream DTT Network Dual Tuner is available from the Elgato online shop for £230.